Hidden somewhere deep in “The Lanes” in Brighton is a great little café that goes by the (somewhat appropriate) name “The Lanes Coffee House“. The Lanes is a set of old, narrow streets that form quite a maze, a great place to explore if you are a visitor to Brighton. 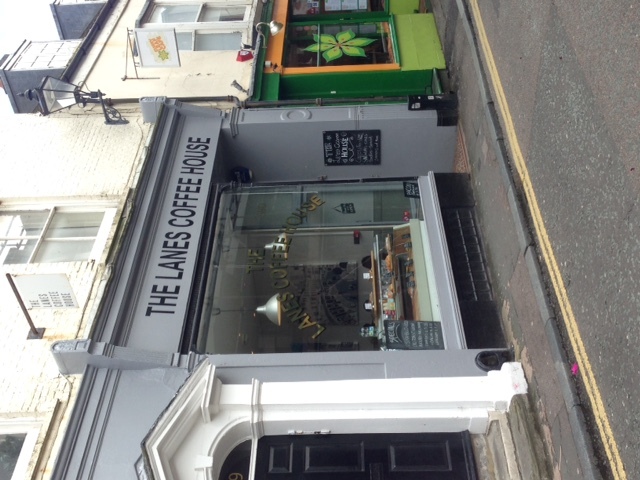 There are two entrances to The Lanes Coffee House, which is fortunate as we may not have found the ‘front’ entrance while wandering aimlessly around a few weeks ago. With plenty of seats inside, and a few at the back, The Lanes Coffee House has a lot to notice if you like to sit in a café, enjoying your coffee, without the distractions of your phone or laptop. Pictures by a local artist decorate the walls, with each picture featuring a Brighton scene and The Lanes Coffee House in a “Where’s Wally” type format. A window opens up to the narrow lane outside and there is also plenty to notice inside the café where we enjoyed an Americano and Soya hot chocolate. Sadly on the day that we tried The Lanes there weren’t any nut-free cakes at the counter and so, as compensation, we had to have a bag of fudge. 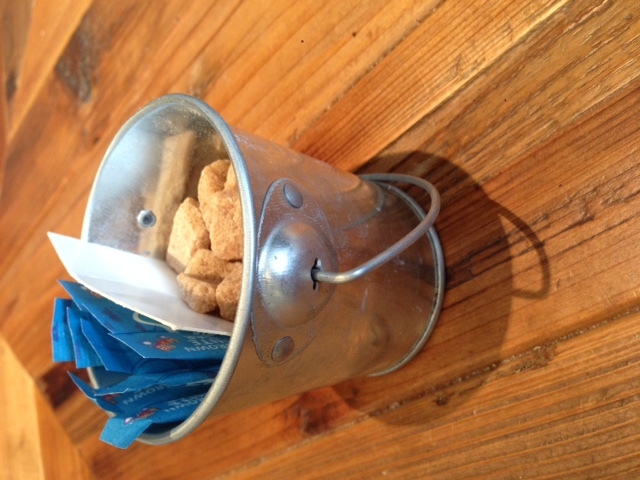 We sat at a table on which there was a tiny metal bucket that was used for holding sugar (see picture). With Brighton being a sea-side town, this immediately conjured up images of sandcastles and picnic sandwiches. The only problem with this image of course is the fact that Brighton has a pebble beach rather than a sandy one. So rather than think about sandcastles I got thinking about something slightly different: If you were to partially fill a bucket with some sand, put a stone from the beach in the bucket and then fill the rest of the bucket with sand, how could you easily retrieve that stone without fishing around in the sand for it? This question came up, in a slightly different way, in a paper published nearly 30 years ago called “Why the Brazil nuts are on top“. That paper dealt with the question of why, in a package of mixed nuts, the Brazil nuts (i.e. the largest nuts) were frequently found to be on top when the package was opened. Termed, the “Brazil nut effect”, it turns out that this question is not just an odd bit of physics but has relevance to the packaging industry and earthquake dynamics. If you were to shake the bucket of sand containing that one pebble, the stone would rise up through the sand, eventually coming to the surface. The question is, what is driving this ‘anti-gravity’ type behaviour? Why do the heavy objects rise to the top? Obviously, being a coffee website, to do the experiment with sand and a stone is a bit, well, dull. So, using dried, used, grounds (well, what do you do with your used coffee grounds?) 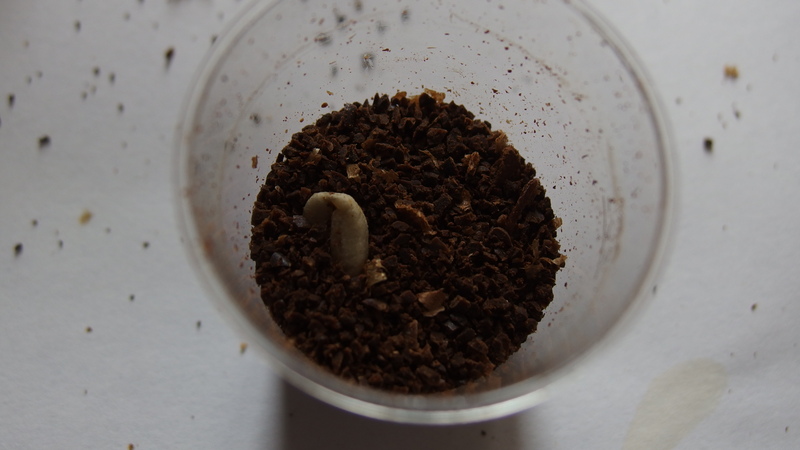 and a green coffee bean*, I repeated the experiment on a smaller scale, in a shot glass. I put the green bean at the bottom of the shot glass and then covered it with coffee grounds (up to half way up the shot glass). To prevent too much mess, I covered the shot-glass with a piece of clingfilm. In order to avoid too much vertical shaking, the glass was hit repeatedly from the side in order to ‘shake’ it. It took 40 seconds of vigorous shaking but the green bean eventually started to poke above the surface. The heavy large bean had moved up through the glass upon being shaken, just as the Brazil nuts end up on top in a bag of mixed nuts. Just how had that happened? It turns out that there are several things going on. Firstly, as the 1987 paper discussed, the small grains of sand (or ground coffee) can fall into voids under the large Brazil nut/stone/coffee bean. This has the effect of pushing the nut/stone/coffee bean upwards until it reaches the surface. The coffee bean could move down through the grounds but this would require the collective movement of a large number of coffee grounds under the bean to form a void large enough for the bean to fall into, something that is fairly unlikely. So the coffee bean will move up, the coffee grounds will move down. Then there is an effect that is more familiar to coffee drinkers, convection. The idea here is that although all the particles in the glass (or bucket) can move upwards as the container is shaken, only the small particles can move down again through the small voids created at the sides of the container. Rather like the movement of milk in a hot coffee, this again has the effect that the small particles push the larger particle up. After this though things start to get more complicated. Along with what has been termed “the inverse Brazil nut effect”, it seems that air pressure may play a role in the Brazil nut effect. Who knew that Brazil nuts could be so complicated! Perhaps though, to finish our train of thought on The Lanes we could turn this effect into a non-physics, almost allegorical, meditation? If we, as a society, are collectively shaken enough, can small, individual actions do what at first seems impossible? I wouldn’t want to push the analogy too far, but it does seem an interesting problem on which to dwell for a further five minutes while you are sipping on your long black (or, as this is officially the first day of summer, your cold brew). (If you’d rather think about the physics of sandcastles, you can find out more about them here). *The green coffee bean came from a jute coffee sack that had been given to me by Amoret coffee for my composting worms. Thanks Amoret!